Ask not what the new marketing can do for you. Ask what you can do to thrive with the new marketing. And marketers are adapting to the new way of marketing. BTW it does not just talk; they’re putting their money here. 24% of Unilever’s global ad budget goes towards digital media; GE spends about 35% to 40% of its marketing dollars on digital media + more stories place digital as the top driver of growth in global advertising. How’s your marketing plan geared towards digital? Not sure yet? Here’re the key insights to help you allocate budget on channels that can give you better ROI. 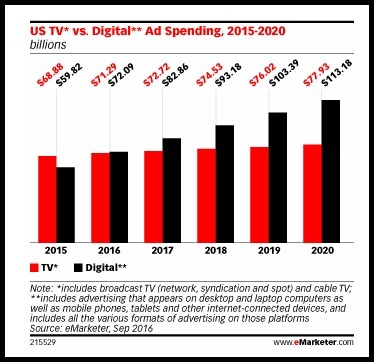 In an article published in September 2016, eMarketer predicted digital will overtake TV ad spending in 2016 for the first time. 2. Where Are The Marketers Investing? In 2013 an article titled “Mondelez says Facebook ads generate sweeter ROI than TV” published in Marketing Week, it was reported that Mondelez International’s Crème Egg campaign drove the same purchase consideration shift through Facebook as TV, for a third of the cost. 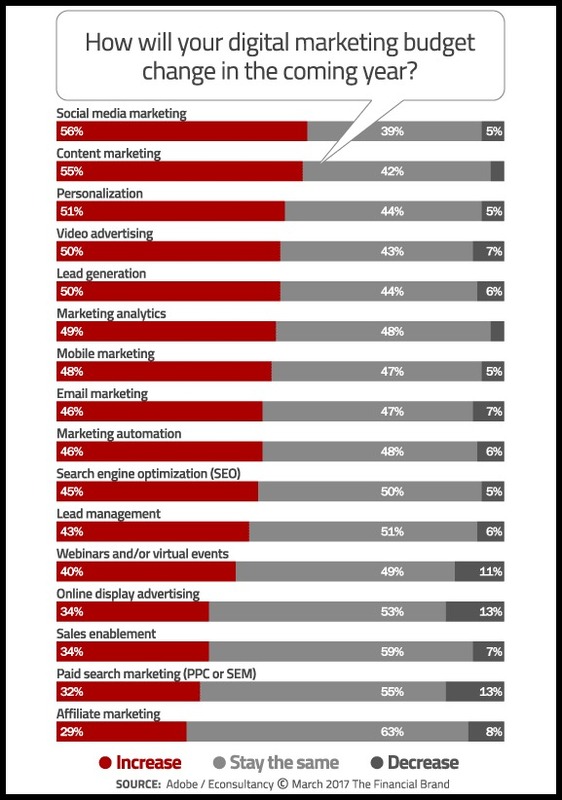 4 years down the line with improved metrics and analytics, marketers are allocating more marketing dollars to social media as per 2017 Digital Trends by Adobe & Econsultancy. The report by 4C titled The State of Social Advertising Q4 2016 found that paid media spend on social channels witnessed a 65% lift YoY. Spending on Facebook saw a 74% YoY increase on the 4C Social Ads platform. In fact, Facebook released a slew of features in the last quarter including Creative Hub, updated metrics and reporting, dynamic ads for mobile app installs, and Facebook Live 360 Degree videos. Another channel that’s marketers are flocking to is Instagram. Instagram Q4 ad spend grew 138% YoY. 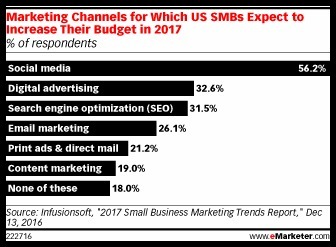 Not only big businesses but SMBs are also planning to increase their social marketing budget in 2017. 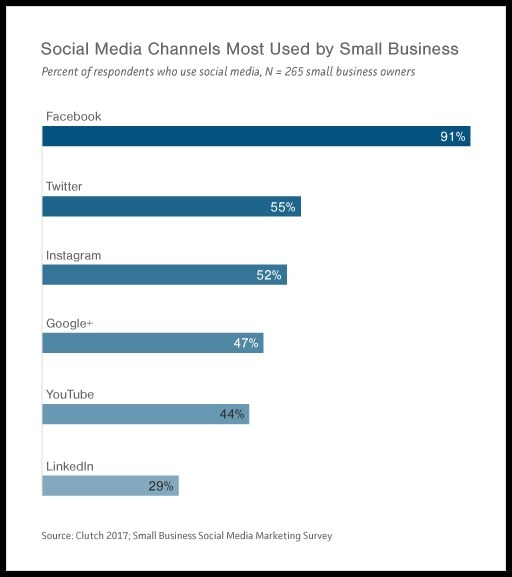 A recent report by Clutch titled Social Media for Small Business: 2017 Survey found that Facebook was the most used channel by small businesses of all types. And Facebook has identified SMBs as their biggest opportunities. In March 2016 it was reported that Facebook had 3 million advertisers and a majority of these advertisers were SMBs. One of the reasons that SMBs are advertising on Facebook is its super-effective advertising platform and the way businesses can target their audience. Facebook has also published a slew of resources to help SMBs advertise the right way. 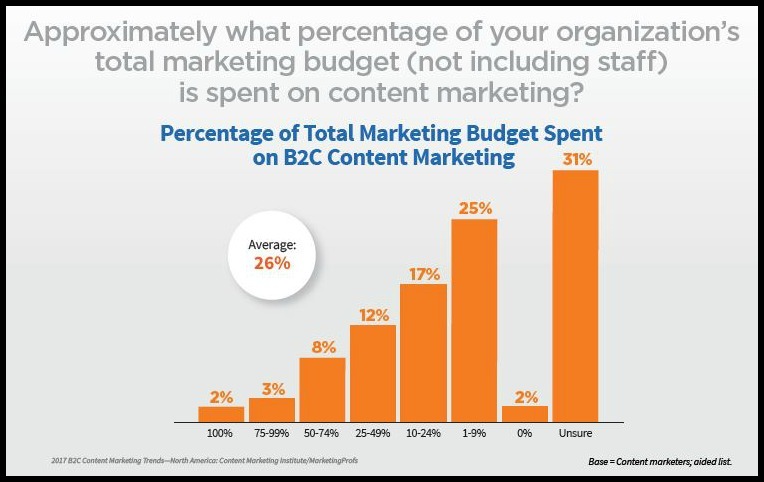 B2C marketers say that average proportion of total marketing budget spent on content marketing is 26%. 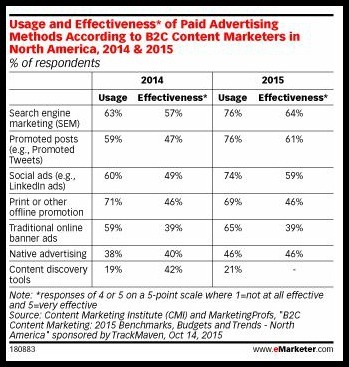 42% B2C marketers are planning to increase their content marketing budget in 2017. As content marketers are realizing the effectiveness of paid promotion, a lot of marketing dollars will be spent on paid advertising methods. Back in October 2015, a survey by the Content Marketing Institute (CMI), Marketing Profs and TrackMaven, showed that 61% of B2C content marketers (compared with 47% of marketers in 2014) said promoted posts such as Promoted Tweets were effective. Facebook is definitely a popular choice for B2C marketers of all sizes. But Instagram is getting bigger. 6. What’s Your Instagram Strategy? 53% of B2C marketers are buying ads on Instagram! That’s big. In March 2017, it was reported that Instagram has hit 1 million monthly advertisers and has 600 million monthly users. Recently Instagram opened up its Stories platform to advertisers globally for the first time. Instagram is planning to launch more tools to help marketers reach their audience the right way. 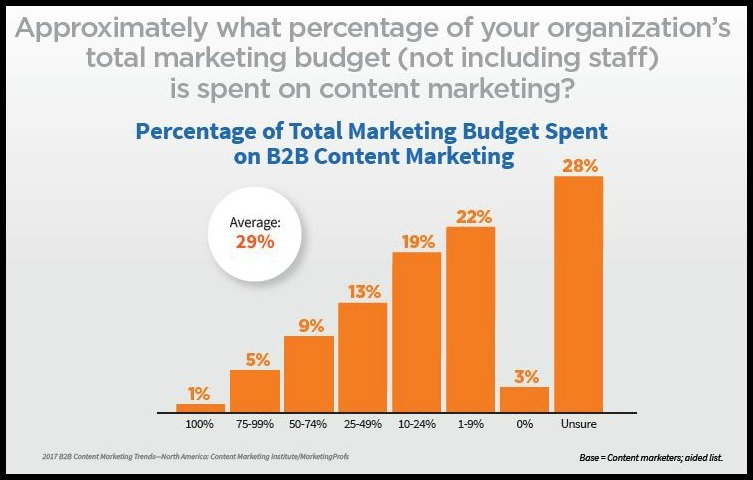 39% B2B marketers are planning to increase their content marketing budget in 2017. 8. Should You Be Investing More On Email? Email is expected to see increased investment from 46% of responding marketers as per the 2017 Digital Trends by Adobe & Econsultancy. As per the same report, organisations investing around 15% of their marketing budget on emails could attribute 23% of total sales to it. Email is definitely a powerful channel and marketers need to take more advantage of it. Let’s see a couple of insights on how marketers across industries are using email. In a research titled Personalization in B2B Marketing Trends provided by Informatica in partnership with Ascend2 it was found that B2B brands consider email message personalization to be their most effective tactic. Factors that play key roles in the success of email message personalization are data enriched for completeness, accurate contact information, and the technology for automating email marketing process throughout complex sales cycles. In an article published in June 2016 e-marketer predicted that US digital video ad spending will witness a double digit growth and will exceed TV advertising growth through 2020. As per Interactive Advertising Bureau’s third annual Video Ad Spend study, nearly 72 % respondents ( which include marketing & media buying professionals) said they will move money out of TV to up their spending on digital video advertising. According to a study from cross-platform video advertising firm YuMe, consumers are receptive to online video advertising in the hours between 3 a.m. and 12 p.m. According to a June 2016 report, most marketers measure digital video ad performance by site traffic, June 2016. However, more respondents want to measure it via cost per acquisition in the next year or so. The latest study found that videos watched for 7 to 16 seconds contributed more toward sales versus anything more or less than that length, despite the industry standard being two seconds with 50% of pixels in view. 15. Long Form Video Ads To Capture TV Ad Dollars? Today, we’re announcing a change to the way we rank videos in News Feed to adjust the value we give to how much of a video is watched. One of the signals we look at is “percent completion” — the percent of each video you watch — to help us understand which videos you enjoyed. If you watch most or all of a video, that tells us that you found the video to be compelling — and we know that completing a longer video is a bigger commitment than completing a shorter one. As we continue to understand how our community consumes video, we’ve realized that we should therefore weight percent completion more heavily the longer a video is, to avoid penalizing longer videos. According to the CMO survey, the levels are higher for business-to-consumer companies: 38.5 % for business-to-consumer service companies, and 33.2% for business-to-consumer product companies. As per the CMO survey, lack of processes or tools to measure success through analytics is the biggest factor that’s stopping marketers from using marketing analytics. 18. Mobile Ad Spend Will be Huge. TV ad spend affected? It’s clear that the younger consumer engages with us predominantly over the mobile device. Digital engagement is key for us – you don’t see any TV advertising any more. With the who’s who of technology companies ( Apple, Google, Microsoft & Amazon) investing in digital assistants the landscape of voice search is certainly changing. In 2016, Sundar Pichai announced that 20% of all queries that occur on Google’s mobile app and Android devices are voice searches. If voice search continues to grow at the current pace then, at least 50% of all searches will use either speech or images by 2020. A survey by Clutch titled Small Business SEO in 2017 found that 52% SMBs invested in SEO in 2016, and in 2017 that number is expected to grow to 74% in 2017. 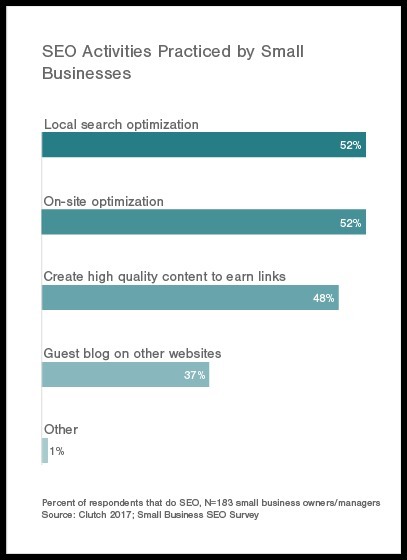 As per the same report, most SMBs prioritize on local search marketing. Fake news, ad fraud and non-premium content are challenges that marketers are facing when placing their ads, as per a report titled Marketers Need Targeted and Brand Safe Environments. Recently Google lost advertisers including Verizon, PepsiCo, Walmart Stores and Starbucks after the brands found that their ads appeared alongside offensive videos. As per a note from analysts at Nomura Instinet Google could lose up to $750 million from the advertiser boycott. Need help in planning your marketing budget? Join us at DMC.